Here at Danbrit Shipping, we have recently teamed up with Achilles FPAL. We have put together a brief explanation of what they do. Over 2,000 individual buyer users from around 100 operators and contractors organisations for you to promote your products and services to and be directly invited to tender for. Publicly available tender opportunities enable you to identify contract opportunities and plan activities. Promote successful contract delivery to customers and compare business performance against key competitors using the Achilles Performance Feedback module and Benchmarking facilities. 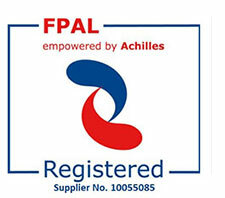 Access personal details for key supply chain, procurement and commercial personnel through Achilles FPAL. Complete and maintain a single Advanced Registration Questionnaire (ARQ) for the industry, reducing repetitive requests for information. Advance Registration is an in-depth desk based assessment by Achilles FPAL Assessors of a supplier’s capabilities using an online questionnaire submission. It allows suppliers to streamline pre-qualification to buyers by replacing multiple and generic requests for information from buyers with an agreed single Advanced Registration profile output valid for two years. The availability of Advanced Registration results save time, resource and cost across the industry and aids the elimination of duplicated prequalification data exchanges. FPAL Verify involves an audit visit by an FPAL Verify Auditor to a nominated supplier’s premises to assess their capabilities in the areas of Quality, Health & Safety, Environment and Competence and Training. It allows suppliers to streamline pre-qualification by replacing multiple and generic requests for information from buyers with an agreed FPAL Verify report, Improvement Plan and Advanced Registration profile output valid for two years. FPAL Verify is a funded service that is largely supported by the Verify buyers. The availability of the audit results saves time, resource and cost across the industry by making the results available to buyers immediately.